» Guga is 39 today! Gustavo “Guga” Kuerten is 39 today! He is the first South American to finish the year (2000) as world No. 1 in the history of the rankings (since 1973) and Kuerten broke an eight-year hold of players from the U.S. on the year-end No. 1 position. He is the only player to defeat Pete Sampras and Andre Agassi in the same major tournament (Tennis Masters Cup in Lisboa, 2000), furthermore he completed it on indoor hard court! He claimed 3 Roland Garros titles, each of them in classy way! In 1997, he played 15 sets, three consecutive 5setter matches en route to the final (beating 2 former French Open champions Muster and Kafelnikov as well Medveded, finalist in 1999), and in the final he defeated the 2 time champion Sergi Bruguera in 3 straight sets. In 2000, Guga won his second French Open title by defeating Magnus Norman on his 11th match point! Following year, Kuerten saved a match point against Michael Russell in the fourth round and Coria, Corretja, Kafelnikov and Ferrero were among his vanquished opponents. Winning at Roland Garros three times in Open-era (1997, 2000-01), the popular Brasil has joined the elite group of Bjorn Borg, Ivan Lendl and Mats Wilander. Only Bjorn Borg, and Rafael Nadal, has won more titles in Paris since 1968. 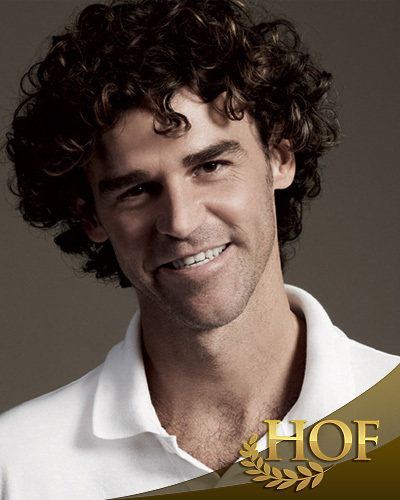 Kuerten was inducted into the International Tennis Hall of Fame in 2012.